Our Designer Faux Wood Vertical Blinds offer the ultimate in durability and versatility. Featured in several colors , the stained 3 1/2" vanes give the appearance of wood at a price that will lead you to believe that these are Cheap Vertical Blinds. They are anything but. 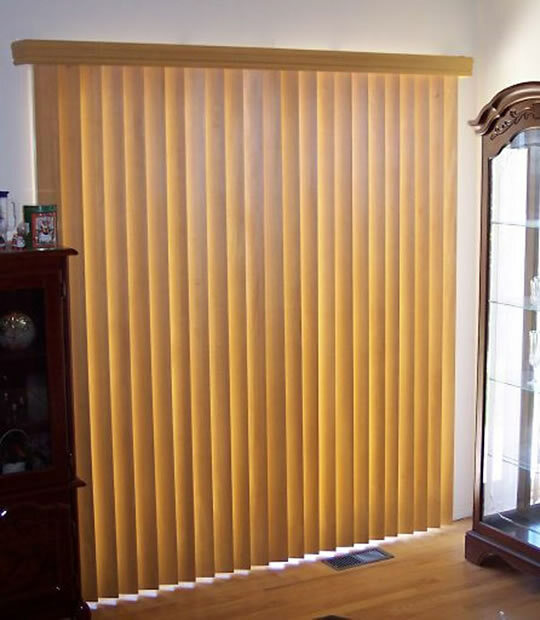 These are simply vertical blinds at a very affordable price. These Vertical Blinds come with a variety of control and stack options that make them one of the most appealing decorating options available. The colors also match our 2" horizontal faux wood blinds, allowing you to color coordinate standard windows and sliding glass doors. As with all of our products these faux wood vertical blinds come with free shipping and a limited lifetime warranty. Most colors available in 2” Designer faux wood horizontal blinds. Real wood looking vanes at a fraction of the cost. All outside mount valances will be cut 2" wider than blind width.